As winter ice locks down the Wellfleet marshes a full month earlier than last year’s freeze, one cannot help but marvel at the amazing survival skills of our local diamondback terrapins who live at the northernmost edge of the species’ habitat. 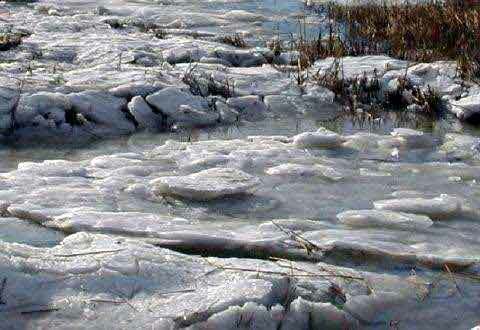 Unrelenting northwest gales and frigid temperatures have transformed the Land of Ooze into an Arctic landscape. Hard to believe . 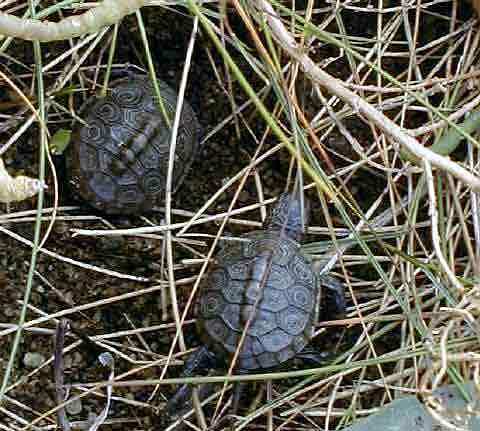 . . just two months ago tiny 6-gram hatchlings were emerging from upland nest sites . . .
. . . and scurrying for the protective nursery habitat of these same salt marsh creeks. How they manage to endure these harsh winter conditions while their cousins are still basking in Florida sunshine challenges researchers and poets alike. Three hundred eighty years ago, their ancestors watched stoically as long boats from the Mayflower with our ancestors aboard investigated Wellfleet Bay for the first time. So, I guess they may be even better at this than we are; they’ve had a lot more practice. Still, when you look at the very spot where these little critters disappeared into the “safety” of the marsh in October, you’ve got to admire their plucky survival skills. If it’s the unexpected that keeps naturalists energized when conditions would dictate a good book and a raging fire, then I guess I hit jackpot this afternoon. Temperatures hung in the twenties with sustained 25-knot winds whipping across the bay from the northwest. 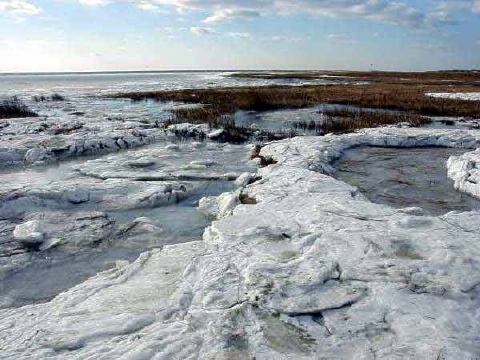 The wind chill plunged to zero and below, and several feet of slush ice had formed at the intersection of the channel and the shore. The last thing I would expect to encounter, other than a stone-cold terrapin of course, would be a live horseshoe crab. 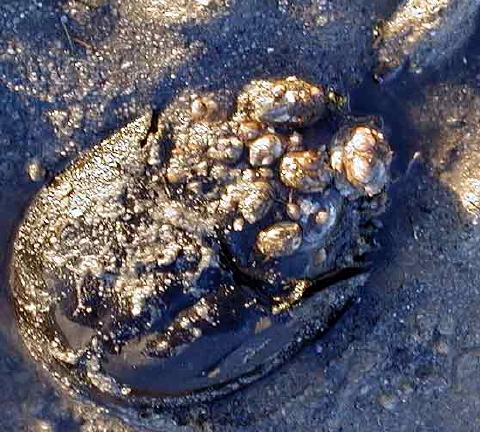 Yet, here was an adult male, sporting a decorative colony of parasite shellfish and burrowed into the low tide exposed beach off Lieutenant Island’s north shore. Last season began an important research program on the Cape to formally study our native horseshoe crab population. In the face of substantial harvesting of these critters for biomedical purposes, as well as for conch and other fishing bait, we felt obliged to nail down some concrete data to underpin any future policy changes. As part of this project, nearly a thousand adults were tagged to study migration and behavior and physiology, and to obtain a rough population estimate through capture-mark-recapture efforts over a number of years. As I patrol wrack-strewn beaches and marshes in the study area, I routinely examine molted shells and horseshoe crab remains, which wash ashore with the tides, to see if they are marked or not. So, this afternoon at dead low tide as I walked the shoreline and spotted a horseshoe crab shell, I stopped to check it. I realized at once that this one was quiet alive and had dug itself into the beach sand about two feet from the receding tide line. I flipped the crab over to determine gender and its reactions were anything but sluggish. It seemed to move as normally as in the summer. I saw that he had the telltale “boxing glove” clasper at right front, but the end of the left “boxing glove” appendage was missing. On his back, the tail immediately went into action to right himself. 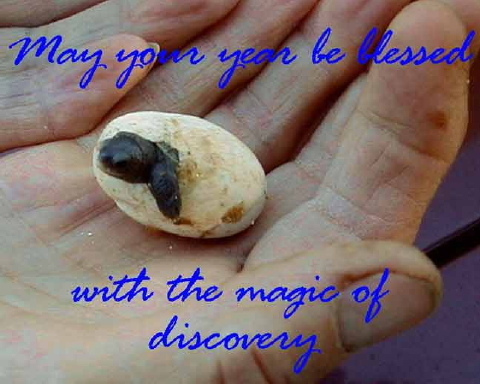 I saved him the trouble and returned him to his repose, reburying his shell with moist beach sand. 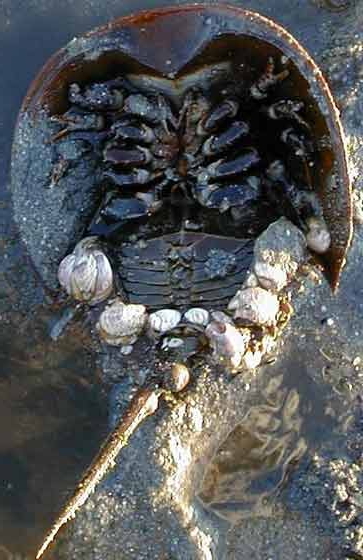 What the heck a horseshoe crab was doing out of his hibernacula in these conditions is beyond my ken. But it’s these little surprises that keeps us outside our winter hibernacula, too. Driving rain and gusts exceeding 50 knots slammed against the Outer Cape last night. 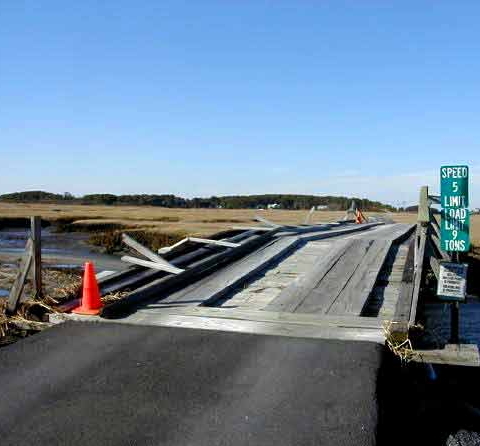 Augmenting an already significant tidal flow, the storm thrust tons of wrack and debris through the marsh channels and against the one-lane tinkertoy bridge spanning the Lieutenant Island causeway. The windward railing collapsed under the strain. Along the shoreline along Turtle Point and Turtle Pass, the storm wrack piled 10 to 20 feet deep and several feet high. The surge reached far above the high tide line, raking nesting dunes and potentially drowning any lingering, over-wintered hatchlings. The extent of this tide matched the late January storm flood of last winter. 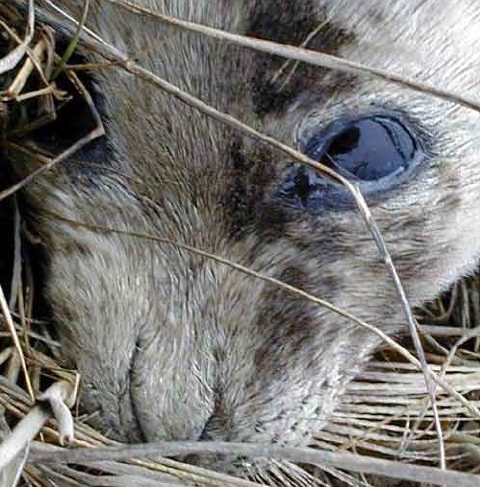 At low tide this morning, I executed a patterned search of the marsh south of Fox Island, focusing on the areas where the young harp seal was first detected on Saturday (star) and again Sunday (diamond). 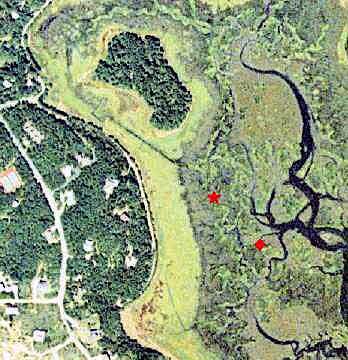 There was no sign of her, but this marsh area is quite extensive with acres upon acres of thick grass laced with serpentine channels and quick-mud sink holes. No ground search, no matter how exhaustive, could conclusively confirm her presence or absence. I’ll continue to check this area during my regular terrapin habitat patrols. The Cape and Wellfleet were blasted by a storm front last night with winds howling from the south with over 50 knot gusts. 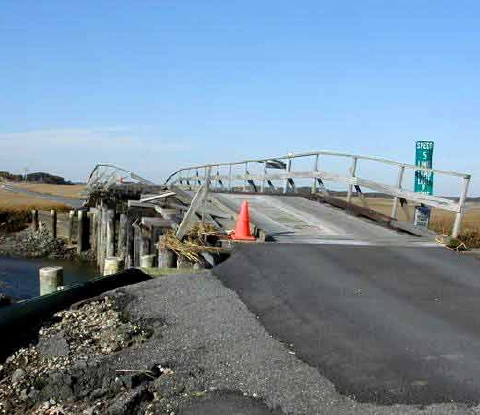 It struck with enough force to down power lines and damage the Lieutenant Island bridge. Today the breeze has swung to the west at a more moderate 25 to 30 mph. One wonders whether this gentle critter might have sensed the impending storm and took refuge deep in a protective marsh system almost akin to a hurricane hole. Just wondering. 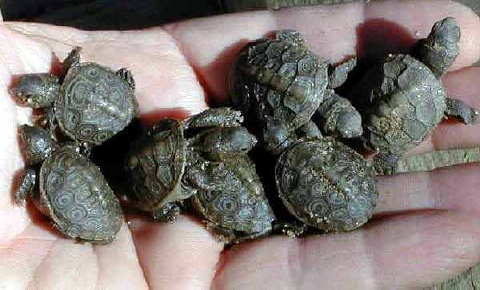 You are currently browsing the Turtle Journal blog archives for December, 2000.